We came across Northern Flyway by chance in January. With a gap in our schedule for the weekend we were at Celtic Connections in Glasgow, we picked the show from the programme that sounded most interesting (and besides, Sarah Hayes was playing in it; we'd seen her with Admiral Fallow). Taking our seats in the Tron Theatre back then, we didn't know what to expect. Tonight was different: we'd seen the show and knew the music so had to return to for the London date of the tour. Just about every way of classifying Northern Flyway won't do it justice. Is it folk music? Beatboxing? Theatre? Nature documentary? Birdsong catalogue? And dare you mention the gorgeous custom knitware? Imagine all these elements brought to life with beautiful harmonies and a heartful of joy and you'll begin to approach the experience. Two curlews duet about their lifelong bond, singing of dancing above heather moorland; waxwings flock and wheel around the sky in a twittering bundle, and owls find safety and shelter in the statue of Athena, their ancient protector and the source of the enduring myth of their wisdom. Folklore, ornithology and sociology mesh together. Stories of the struggles of migration apply equally to bird and human endeavours. Perhaps we're sounding too enthusiastic. 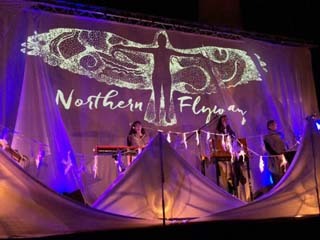 But here's the thing: Northern Flyway is a unique production that we're delighted to have caught. We'd recommend everyone go along. And if you can't get to a show, the album was released last week providing the sonic experience if not the video and knitware. Posted by pab at 23:24 | Comments will be back one day. Please email me instead!